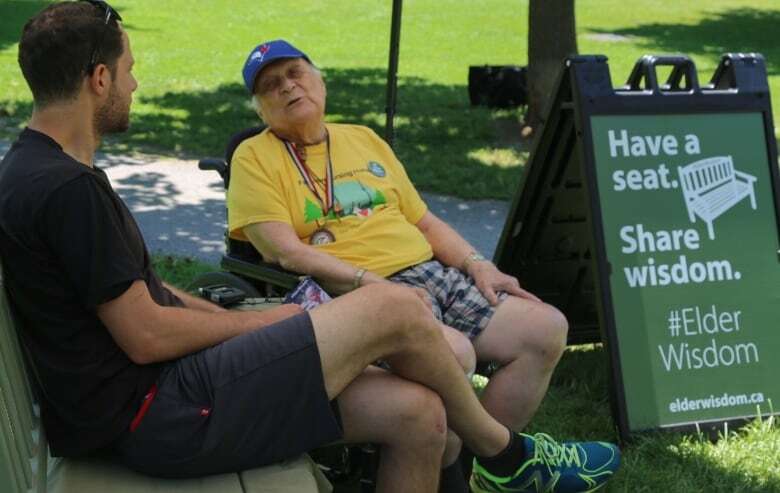 Seniors in Trinity Bellwoods Park sat down with strangers Friday and gave them advice - all in an effort to combat ageism. "Always be polite. A person smiles at you, smile back." 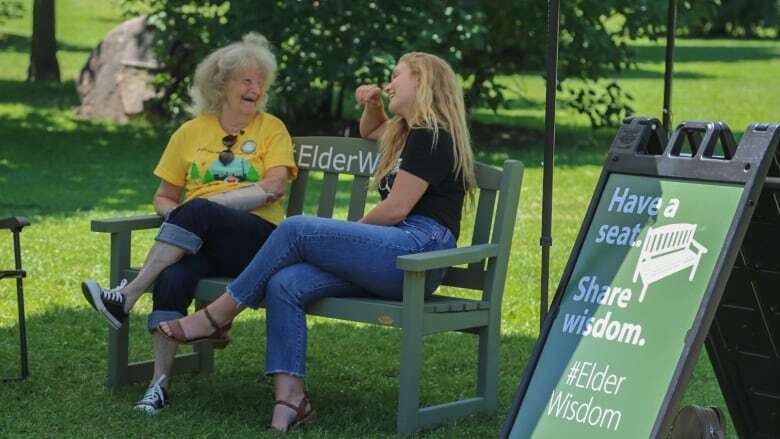 Those were words of advice from Carol McNeil, a senior who journeyed to Trinity Bellwoods Park from her local retirement home for the afternoon and invited strangers to chat with her. "I love helping people, I love talking to them," McNeil told CBC Toronto's Talia Ricci. "I was so excited I could hardly sleep last night." 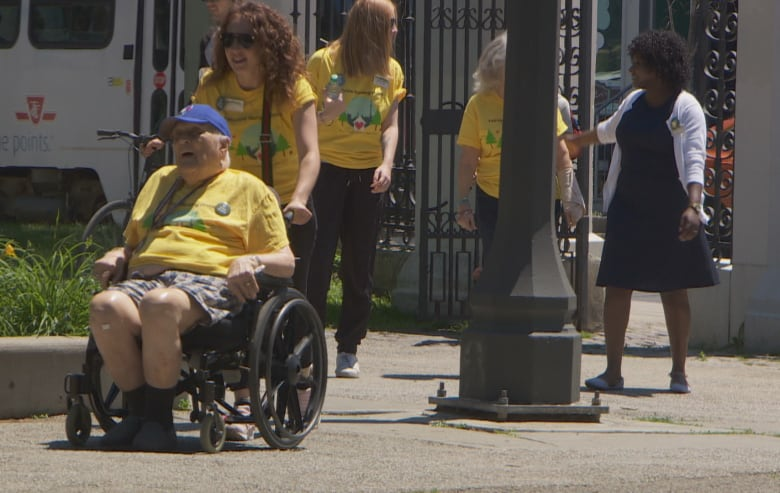 McNeil came to the park with organizers from Fairview Nursing Home, near Dufferin Street and Dundas Street West, to celebrate Seniors' Month in Ontario and to promote dialogue between seniors and the rest of the public in an attempt to combat ageism. "The younger generations can learn, I can learn — anyone can learn — from a senior in any aspect of life," said Ted Mahy, one of the organizers of Friday's event. Mahy is the online engagement manager for Schlegel Villages, a long-term care facility that has 19 locations across the province, one of those being Fairview Nursing Home. Several of those villages have organized similar "chat with a senior" initiatives in local parks. Fairview Nursing Home is one of several locations across the province conducting similar sit-and-chat initiatives this month. (Martin Trainor/CBC) "An 18 -year-old was talking about dating advice from a woman who is 80-something," Mahy said. "My hope was that he walked away from that conversation with a little bit of knowledge from that resident." They talked all things — from dating to Toronto's history — and gave what advice they could to the strangers who stopped to chat. McNeill suffers from Alzheimer's, so days like this are very important to her. "When you're getting older, you feel alone, like nobody cares anymore, like you can't do as much as you can before," she said. "I used to have a pretty good memory, but old age is taking over." She connected with a young woman, Julie Germansky, about books and moving to Toronto. Not only did they hug each other goodbye, but Germansky is visiting her later this week to give her a book she recommended. "We don't have enough face-to-face conversations these days," Germansky said. "They've lived a longer life than me, right?" Although the nursing home had anticipated six seniors would be involved in the excursion, only two were feeling up to it. Robert "Bob" Rook was the other senior who volunteered. Passerby Zygmunt Strawczymski talked with volunteer Robert Rook about the history of Toronto. (Martin Trainor/CBC) "I'm 84-years-old almost and I like to give information I've acquired over the years I've lived, so here I am," he said. He connected with a passerby, Zygmunt Strawczymski, about Toronto, travel and growing up. "Bob's full of stories," Strawczymski said. "When I come to be your age, I hope someone comes to talk to me." Rook had many words of wisdom for his new acquaintance. "Hold onto your job," Rook said. "Don't go from job to job, you'll get nowhere. Stick where you are."